The band's third release is titled, like the debut album, simply Santana. It soon became known as Santana III, to distinguish it from the first record, and the label has stuck. 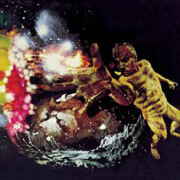 For this album, the group attempted to build on the successful formula that worked so well for Santana and Abraxas. Sadly, the third time was not the charm, as is evidenced by the uneven nature of Santana III. There were several changes in the lineup for this CD. First was the entrance of percussionistists Thomas "Coke" Escovedo and Rico Reyes, filling in for Jose "Chepito" Areas, who was temporarily sidelined due to a brain aneurism. Second was the addition of a very young Neal Schon, who in the last four decades has made his own mark on music, namely through the success of seminal rock band Journey. It's true that Santana III did hit number one on the Billboard charts in 1971, but none of the original recordings have demonstrated the staying power of Santana's earlier hits (notably "Evil Ways," "Oye Como Va," and "Black Magic Woman"). Luckily, some of the songs have become staples in Santana's live show, and were fortuitously re-released as live versions. Opening the album is "Batuka," an instrumental jam based on one progression, ala "Soul Sacrifice." Unfortunately, Batuka never captures the spirit of the song immortalized in the film Woodstock. Next is "No One to Depend On," a classic Santana song with gang vocals, hooky percussion breaks, and an unusual feature for Santana: guitar harmonies. A live version of this song released on Sacred Fire: Live in South America is more powerful, though it loses some of the crisp feeling of the percussion riffs on the original. "Taboo," with lackluster vocals from Gregg Rolie and tepid guitar fills from Carlos, becomes more interesting in the end, but only in that you begin to hear the style that Neal Schon later refined and used to fuel Journey's success. "Toussaint L'Overture," a powerful song that has become a staple in Santana's live show, opens with a descending progression, then heads into a B section which contains trademark organ and guitar solos by Rolie and Santana. There's a great breakdown featuring some potent percussion work, then looping vocal harmonies are introduced. The descending chord progression returns for the extended outro, with Schon and Santana trading some of the best guitar riffs on the album. Taking a complete left turn, the band launches into "Everybody's Everything," a funk song that sounds like it would fit better on an Earth, Wind & Fire record. Schon again appears at the end, using a wah-wah pedal and trading riffs with Carlos. Like No One to Depend On, "Guajira," which first appeared on this album, was re-released on the live album Sacred Fire: Live in South America. While the original has some interesting jazz piano work by a guest player, this version is not nearly as powerful as the live recording. "Jungle Strut" is another instrumental, which turns into a somewhat formless jam. This song, written and originally performed by tenor saxophonist Gene Ammons, doesn't seem like a good fit for Santana. Featuring a rare lead vocal by Carlos, "Everything's Coming Our Way" is a rather mediocre pop song, that also doesn't feel like a good fit for the band. Finally, the album ends with "Para Los Rumberos," a remake (like Oye Como Va before it) of a Tito Puente song. While Santana's version has some interesting moments, as a whole it is forgettable. In retrospect, it seems evident that this record finds the group without the fire that characterized their first two albums. That analysis is supported by the fact that this is that last record that includes the entire original lineup.